Strategic Intent which shows a commitment to building individual and organisational capacity over the next five years including the pursuit of specific long-term bodies of work to be undertaken during the life of the Strategic Direction document. Guiding Principles which are designed to shape the way we do business by focusing on values and leadership. It has no time limit. Business Priorities which outline the strategic priorities for a twelve-month period and are linked to each of the four Output Groups as well as operational and other priorities, to guide the delivery of our Vision and Mission. Action Plans which detail how each Command or Business Unit will deliver on the Business Priorities for the twelve-month period. Annual Report which showcases the year’s activities and reports on the Department’s performance. The Department of Police and Emergency Management (DPEM) consists of people, systems and resources that deliver policing and emergency management services on behalf of the Tasmanian Government. The Department comprises Tasmania Police, the State Emergency Service (SES), Forensic Science Service Tasmania (FSST) and the Tasmania Fire Service*. Tasmania Police is comprised of four geographical police Districts, which are assisted by specialised support areas. SES consists of three regions and is supported by a State Headquarters. FSST provides a comprehensive range of forensic biology and chemistry services in Tasmania. *This document does not include the Tasmania Fire Service as it produces its own Corporate Plan. Guiding Principles have been developed to shape our people’s thinking and behaviours to achieve organisational goals. The establishment of the Guiding Principles will enhance DPEM’s reputation as a progressive and inclusive organisation striving for success. To meet DPEM’s Vision of ‘a safe, secure and resilient Tasmania’ the Department will focus on the Values of Integrity, Equity and Accountability, as these provide a sound foundation for the types of ethical behaviour expected from our people. This behaviour will be demonstrated in our work, including when we deliver services to the community, and when interacting with each other. To achieve the Department’s Mission of providing a high-quality policing and emergency management service, strong leadership will be delivered at all levels of the organisation with an emphasis on People, Innovation and Business. Goal 2: An organisation that strives for community satisfaction when delivering its services through its professionalism, responsiveness and commitment to the community. The operational delivery of the services that are included within each Output Group are reflected in the Command or Business Unit Action Plans. The Department is committed to building individual and organisational capacity in order to provide high-quality services to the Tasmanian community. DPEM will build this capacity by delivering strong leadership at all levels of the organisation through an emphasis on People, Innovation and Business in order to confront future challenges and opportunities. DPEM is committed to serving the people of Tasmania in the most efficient and effective manner. To this extent, the use of innovation and sound business practices is crucial to the provision of quality services, particularly given the budget challenges currently facing the State. The deployment of the right resources in the right place at the right time is fundamental to high-visibility policing. The challenges of a reduced budget make it even more vital to ensure that we have well-trained, well-equipped and well-accommodated people in the areas most in need. The continued refinement, implementation and monitoring of the Department’s People Plan and Strategic Asset Management Plan (SAMP) will assist in ensuring that our people are best-placed to serve the community’s needs. The use of technology is becoming more widespread in the modern Emergency Services sector. The ability of this Department to identify and use developments in science and technology to improve service delivery is a key strategic focus for the organisation. The modernisation of the Department’s information technology infrastructure will present opportunities to make information more accessible to our customers and also within the organisation. With greater accessibility comes the challenge of ensuring that the appropriate mechanisms are in place so that information is accurate and secure and meets performance expectations. This will become a strategic focus in our approach to information management. We will continue to encourage our people to think laterally through the identification of innovative approaches to the way we do our business and how we support the community. This ‘can do’ philosophy should be embraced at all levels of the organisation. DPEM will continue to explore opportunities to develop business models which best support the provision of front-line service delivery in the most efficient and effective means. We will embrace the opportunity to collaborate and maximise possibilities at a whole-of-government level, particularly in the areas of business process and information management to assist in meeting budgetary challenges. We recognise the need to ensure that support services are delivered to the emergency services sector in the most efficient manner, in order to make sure that wherever possible, funds are provided for the delivery of front-line services. The opportunities for collaboration and integration with local government, the broader emergency services sector, members of the criminal justice system and national partners will continue to be explored and implemented where appropriate. Report on Government Services – a national report which helps to inform improvements to the effectiveness and efficiency of government services. National Survey of Community Satisfaction with Policing – an independent survey about perceptions of safety in the home and local community, and about our policing service. Tasmania Together – a long-term vision for Tasmania which includes a comprehensive framework for achieving the aspirations of the Tasmanian community. Budget Paper No 2 – Government Services Volume 2, Department of Police and Emergency Management Chapter which details information on the outputs delivered by the Department. Organisational Performance Reporting – internal performance reporting processes. Annual Report – reports on Business Priorities and performance against budget. This document provides a set of principles to guide all policing activities and four directions that focus on communities, crime, safety and resources. Together they provide policing organisations with leadership, support and guidance in order to preserve community safety and security. This document is a long-term plan for Tasmania, with confident and safe communities identified by Tasmanians as an important goal. This document shapes the way we do business by focusing on values and leadership. This document provides a longer-term strategic direction for the organisation from 2012-2017, and beyond. This document outlines the strategic priorities for the twelve-month period. This document sets out in detail how each Command and Business Unit will deliver on the Business Priorities for the twelve-month period. This document showcases the year’s activities and reports on the Department’s performance. 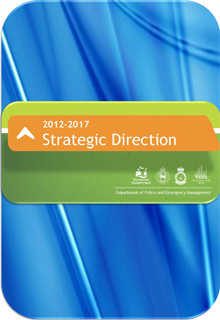 For further information view the Department of Police and Emergency Management ‘Strategic Direction 2012-2017‘. This page -- https://www.police.tas.gov.au/historical-corporate-documents/strategic-direction-2012-2017/ -- was last published on October 17, 2017 by the Department of Police, Fire and Emergency Management.